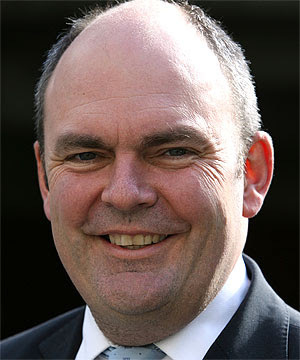 Prime Minister John Key has announced a mini-Cabinet reshuffle, with the big winner being first term high flier Steven Joyce. Mr Joyce picks up the tertiary education portfolio previously held by Education minister Anne Tolley, who Mr Key said needed to focus on the Education portfolio and the introduction of national standards. Mrs Tolley has been seen as one of the weaker peformers in the National Cabinet. The guy hasn’t even been an MP and now he is a Cabinet Minister AND is running tertiary education????? It seems if you attempt to warp democratic principle your reward can be a high party place ranking on the National list, let’s remind ourselves what we know about the hollow brain from the hollow men…. And now he's running tertiary education, if anyone can denigrate a politician until they break it's Uni students, take this information and burn him. While Tolley is a fool and totally unsuited to the role of education minister, I too worry about the influence Joyce has in this government. The Hollow Men was an enlightening book, and now that the major villains in that book are presently running the government, this book should be read by concerned New Zealanders. Classic: those 6 points are exactly what good, hard working law abiding NZers wanted and continue to want. It is people like you that have a problem with it. You are the outsiders. Are you going to carry on crying or make the super human effort of finding a way to get over it? Again: you are the outsiders with the warped view. Classic, it's always the brave anonymous posters isn't it folks? Why not have the balls to put your identity next to your opinions Anon? For all your wailing of me being the outsider you seem too frightened to put your name to your thoughts. None of the 6 points are policy, just focus meeting tested bigotry used by Crosby/Textor to play to the small mindedness you so perfectly exemplify brave anonymous poster. If pointing out your knee jerk talkhate radio bigotry makes me an outsider, it is a position I hold in high regard brave anonymous poster. I won't hold you up brave anonymous poster, I'm sure you have books to burn somewhere. Whatever Crosby/Textor are being paid to play to the petty bigotry of National Party voters, double it. Even the brave anonymous poster here can manage to overlook Joyce's clear deceit over meeting Crosby/Textor to praise their 6 manipulations and claim it as close to his heart. Genius spin doctoring by C & T.
A vast gulf has developed between the values and opinions of the educated and the rest of us. Yeah Bomber a self made millionaire is a 'hollow brain'. Is there no end to your envy? After all he is a media sucess while you and alt-tv went down the gurgler. To Classic: the 6 points "Anon" above. So why isn't Joyce brave enough to actually SAY that's what his agenda is? The six points at first seem noble enough, that is till you realise that the many exceptions to the rule get clobbered by the ideal. 1..There are those that (despite my hatred of political correctness) get clobbered by the likes of those that make a living out of trying to be as politically INCORRECT as they possibly can - they even include that total fuckwit Paul Henry. 2..Quite a few have legitimate grievances - often minimised by what Joyce (or that Wanganui Mayor idiot, Hyde, et al) considers to have become an industry. 4..Let's prevent those that actually want to get tertiary education and do further study in the name of many that don't by providing the many that don't educational access at the expense of the many that do. 5..Why the pre-occupation with Australian standards? Please....move there if that's what you aspire to. IT might even be profitable to have subsidies provided to the uncommitted. 6.. agreed, but please, let not it be those willing to apply the dole bludger label become the ajudcator. Still, I don't really mind. The likes of Joyce and his ilk, the few passing judgement on the many eventually get the shove. When they do, they often take a while to realise why. Shame that at the moment there isn;t really any viable political alternative. The only other "major" political party is led by someone that used to want to implement neo-liberal, then 3rd way ideology (Including student loans). I'm prepared to wait a decade till we see just what a cockup Joyce's Kapiti highway strategy amounts to. Classic, it's always the brave anonymous posters isn't it folks? Why not have the balls to put your identity next to your opinions Anon? YOU'LL BE PLEASED THAT YOU MADE IT ON THE LIST OF THE LEAST TRUSTED KIWIS LAST NIGHT ON TALK-HATE RADIO.WHY DON'T U HAV THE GUTS TO RING UP? Let me spell it out for you brave anonymous poster - the information came from the Hollow Men - is it a book you have read? It is a play on the title of that book. Envy? I point out all the dodgy things Joyce did from the Hollow Men and that's your definition of envy? 2: I kept a show on Sky 89 - the war on news, and Alt Tv fell over because it was poorly run by the previous 4 owners. As for Christian - that talkhate radio rated me so highly gives me a thrill. Why do people seem to think that just because someone has loads of money then that means they must be smart. I could make a lot of money as well if I sold my soul. Now that ex-Treasury and big business wallies have successfully infiltrated the tertiary sector and now that Joyce is minister in charge, how long before we see the PPP's comming into action. I mean, just think how much cash the universities could put in the bank if they sold the buildings and then leased them back from the new owners, or how much cash could be saved if the economics department was outsourced to the BRT and payment made on a "marks attained" basis? So how exactly was it 'poorly run' bomber. Easy to hide behind generalisations when we all know you had a significant role. "Why do people seem to think that just because someone has loads of money then that means they must be smart. I could make a lot of money as well if I sold my soul." That's true, rich people can be stupid too but that only makes poor people like you even more stupid. ...thank you for letting me air the link again Anon. That article actually explains nothing Bomber. Nice try at deflection. What is it with socialist and apportioning blame where blame should lie. Must be something about their aversion to the concept of personal responsibility. So how exactly was it 'poorly run' bomber. I post a link clearly explaining how it was poorly run and you come back saying it doesn't say that at all and that I'm deflecting, well let's post up the link shall we? This column reported problems on January 23, when the four shareholders Thane Kirby, Ricky Newby, Oliver Driver and David Kennedy passed shares to a company controlled by Easy Factors. Easy Factors approached staff to try and turn the company around in one month, but without success. Kirby - who moved the channel from a weak free-to-air Auckland frequency on to the Sky digital platform - insisted in January the channel was sound and there were no financial issues relating to the owners' exit. But the liquidators' report to March 18 said Alt TV had faced "substantial and consistent losses"
Let me bold that up for you brave anonymous poster But the liquidators' report to March 18 said Alt TV had faced "substantial and consistent losses" Drinnan points out that the 4 previous owners were making one set of claims to the media yet the liquidators' report says something else. Your second line of attack was Easy to hide behind generalisations when we all know you had a significant role. The article clearly points out who the 4 owners were, did you see my name in that article brave anonymous poster? No, you didn't. I produced Alt Tv and got the station the breaking news publicity it earned I wasn't running the financial side, the 4 owners were. Lift your game anon, I see why you post anonymously if this is the best you've got. PS - Oh and for your information brave anonymous poster • Nielson Cume monthly Viewers was 425,000 viewers (this was higher than TV6 & TV 7 at the time). Alt's content and programming wasn't the problem, it was management and being lectured to by an anonymous troll who wasn't even there is just a bit of a joke.